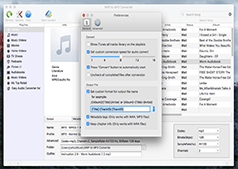 How to Convert iTunes DRM Protected Video to MP3 on Mac OS X ? Download and purchase videos/movies from iTunes store is very easy for us. Sometimes you will find the music in the video is pleasant. And you may wish to use it as a ringtone for your Phone or as background music of other videos or for something else. Spending some money just to download the music is available if you know the name of the music. But if not, you seems to have no idea what to do. Are you just thinking about how to convert iTunes video to MP3? As you know, most iTunes videos are DRM protected. So users could only watch these videos with some Apple devices like iPod, iPad, iPhone etc. Moreover, now what you want to do is extract the audio from the iTunes video. So if you use ordinary video to MP3 converter, the problem can’t be solved well. A powerful software which can remove DRM from the DRM Protected Video and convert iTunes video to MP3, or other formats is just what you need. 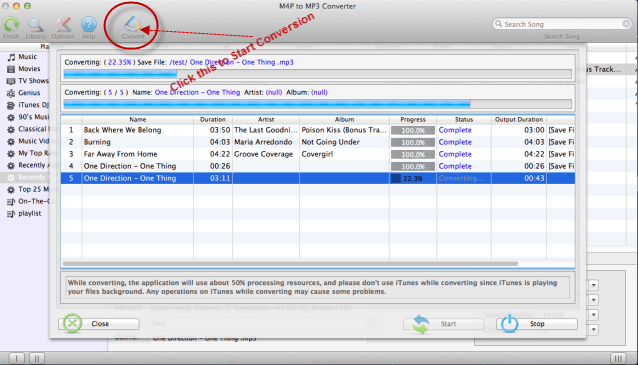 M4P to MP3 Converter for Mac is a simple way to convert iTunes video to MP3 for easy playback on any device you like e.g. BalckBerry PlayBook, Kindle Fire, HTC phones, Samsung Galaxy, Motorola Droids, PS3, PSP, Wii, Xbox, Sansa, Creative Zen, car video, any other MP4/MP3 player and cell phone. The software will easily convert iTunes video into unprotected most commonly-used media formats such as MP3, M4A, M4R, AC3, FLAC and MKA audio. So you can use them for many other purposes such as transfer it to the mobile phone, burn it onto a CD, use the music in a PowerPoint presentation and so forth. With a friendly and simple interface, it is very easy to use. The following guide is going to show you how to bypass iTunes DRM restriction and convert iTunes protected videos to unprotected MP3 files for further using. 1. 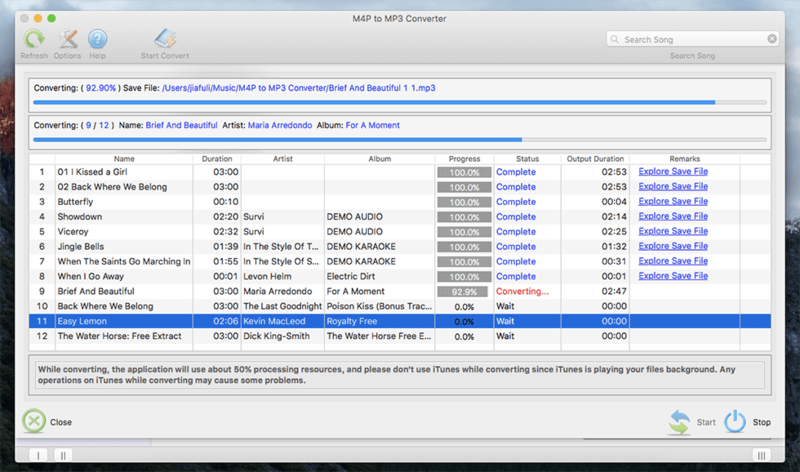 Download M4P to MP3 Converter for Mac. Install and lauch it. Once the software started normally, the itunes will be lauched automatically at the same time. 2. Choose iTunes video files you want to convert. All of your video or audio files will be displayed in "Playlists" which is at the left of main window. When you choose a playlist, the files in the list will show in the right. There will show you detailed information about these files including Name, Duration, Artist, Status and Album. You can choose one or more video files. 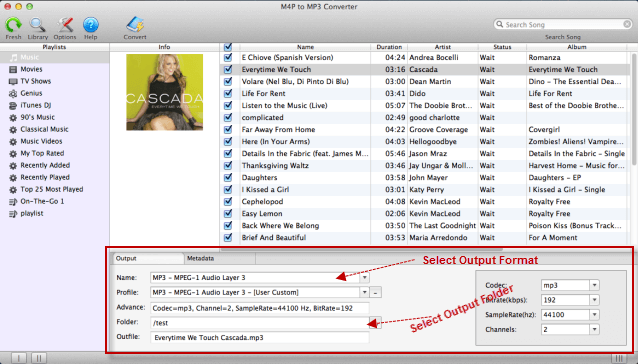 This M4P to MP3 converter supported batch conversion so you can add multiple video files at one time to save time. 3. 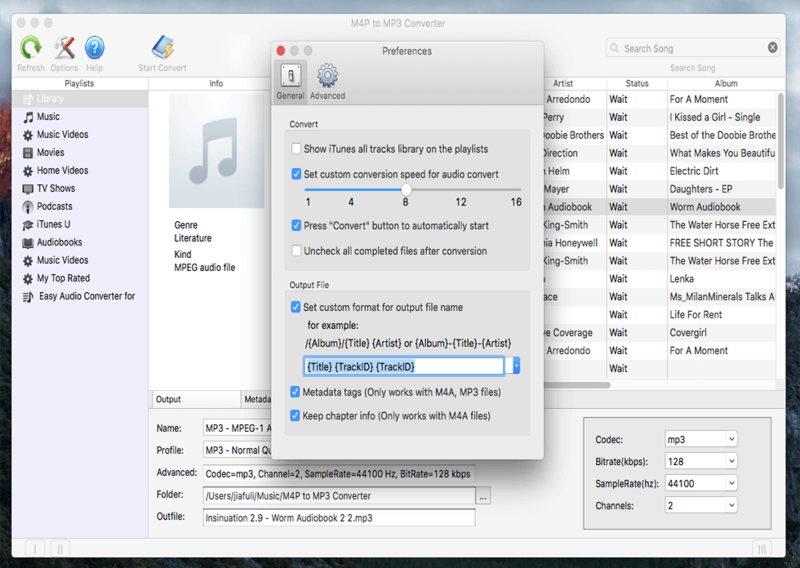 Select MP3 as output format and folder you want to save files in. When you choose MP3 format, the according format parameters will clearly show in front of you. You can also adjust audio parameters like sample rate, bit rate, etc. A destination folder lets you find the output files in the place you hope and you can easily manage them. After completing the previous steps, you just simply click the "Convert" button and can have a rest for a while when it is converting. You will get what you have wanted as long as the convertion finished. Done, Now you can Feel free to transfer unprotected MP3 files to any MP3 player, mobile phone or Windows PC and enjoy them on the go! 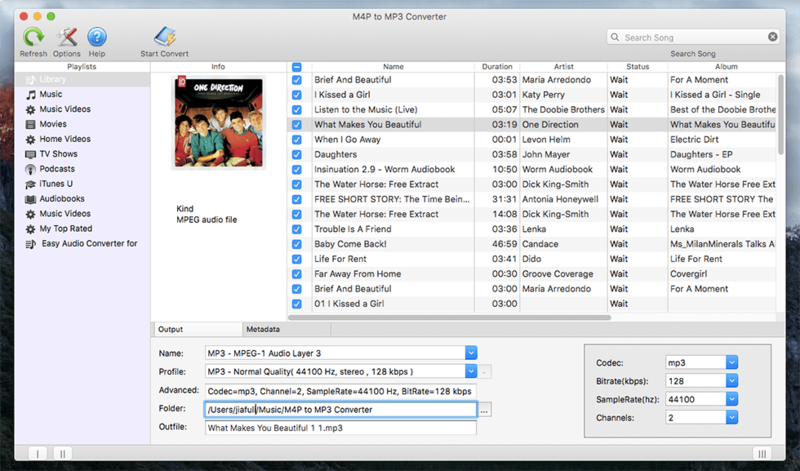 How to Convert M4P to MP3 on Mac OS X.